Toddler Chronicles: Are you going to teach him Spanish? Every time I see my in laws they ask me if I’m teaching Kai Spanish with the addition of when is the next child coming. Most times I tell them how their fluent son doesn’t want to speak, and other times I will say I’m trying…but truth is I’m just embarrassed at how I sound! I know that seems pretty petty, but I’m not a native speaker although my mother is Puerto Rican – and speaks fluently… As a kid I loved understanding the language and often enjoyed speaking it to my grandmother, but found myself being made fun of by other kids I knew because of how I sounded…cue the violins. So despite truly developing my skills (I can read, write, and speak much more fluently now) even using it at my job, I always am a lot more insecure than I would like to admit. Not to mention all of my in laws are native speakers as well – no pressure. So when Kai stepped on the scene (as children do), the first question was “Are you going to teach him Spanish?” Of course! I don’t want my son to be the only one who doesn’t know what anyone else is saying, or feel left out either. But we didn’t really start, and my insecurity of how I sound made me even more reluctant to teach… until recently. I don’t know what it was, but a little over two weeks ago I just went for it. I’ve started slowly introducing Kai to Spanish and speaking primarily to him when we’re together now…and the crazy thing is he completely understands! I’ve found myself being a bit more comfortable as well in public, simply because my goal is to teach and the focus is no longer on how I sound. He has begun to pick up words here and there and understands when I give him tasks or directions. In addition his English has become that much more clearer! Who knew! This evening on our way home, we stopped by the used book store (one of my favorite places) and picked up some new books to add to our collection. I also made sure to pick up a Spanish book to add to our routine (I was hoping for more, but there was a limited selection). You can catch my Spanish reading debut on Instagram soon ha! However, I’m sharing in hopes of encouraging you if we are in the same boat! I’m going to incorporate a Top Five in this (I know sneaky). 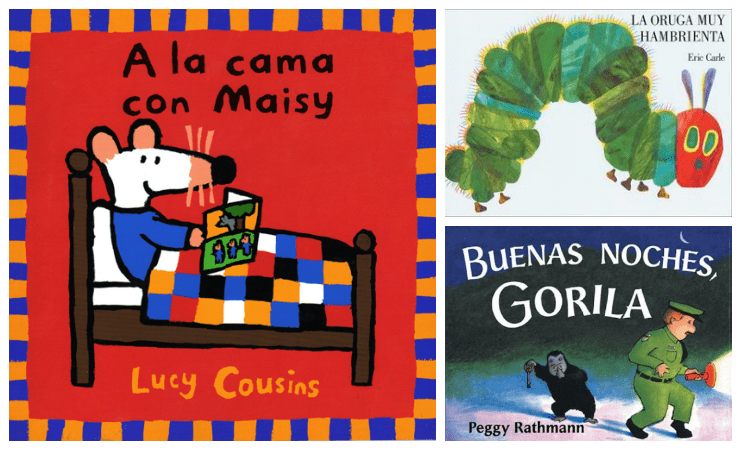 So here are my Top Five: Teaching Tools for Dual Language Development…toddler friendly of course! 1. Don’t underestimate yourself! We often think less of our capabilities, which in turn causes us to never really start. You are a lot more skilled than you know! 2. Consistently Try. The end result is for your little to speak the language, not for them to become fluent within the next several hours. Just as we repeat ourselves in English, the same will need to be done in whatever your language of choice is. Also don’t stress if you find yourself not speaking every single moment of the day. Yes the more you speak the better, but baby steps are just fine! 4. No Pressure! If you’re like me, when I start a task I’m already critiquing how I’m doing and place a load of stress on myself. RELAX…again…relax. Refocusing my goal in just making sure that Kai has the opportunity to speak and understand Spanish helps me to not feel like I have to compare his progress to anyone else. 5. Have fun! Make animal sounds, funny faces, and remember the more you enjoy this the less work it will feel like. Learning any language even your primary doesn’t feel like work (most of the time), so why should this? P.S. Use the alphabet! Pronounce each letter and give examples. Even using the alphabet magnets on the fridge will create at least 15 minutes of fun…let’s be realistic we’re talking about toddlers. We have been enjoying learning what los perros y los gatos sound like along with our new books! I will keep you updated on our progress!